One afternoon last week Charlie and I just had to get out. 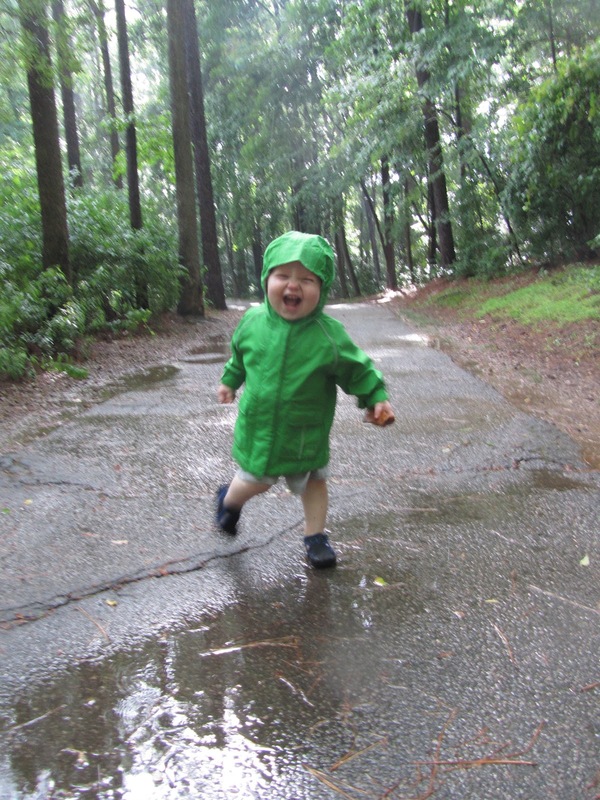 We were going stir crazy and there is only one remedy: get outside! The only problem was that although it was sunny the wind was blowing in a thunderstorm. Oh well. Being from the northwest I know that you can't let rain hold you back or you wouldn't get anywhere! So I threw the rain coats into the stroller and headed to the lake where Charlie could explore without ripping up my lavender seedlings (his new favorite outdoor activity). We were approaching a picnic shelter just as the thunder clapped and the rain came pelting down. We ran under it and put on our jackets. At first Charlie stayed clear of the sheet of water that made walls around the shelter, but after a few minutes he ventured forth and never looked back. Dare I say this was the most fun he has ever had outside? I might just make such a claim. It was as if the wonder of every rock, stick, and bug was intensified. 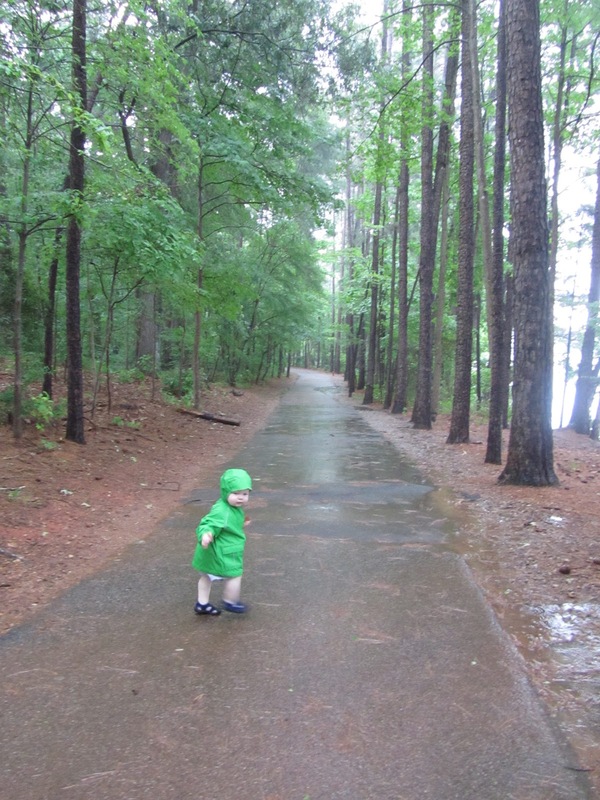 His shoes squeaked, raindrops pattered on his hood, rocks in his hands changed colors before his very eyes, and puddles splashed as he came speeding through them. The kid was in heaven and we both couldn't stop smiling. I have pictures of your sisters at about the same age in their raincoats, stomping in the rain puddles. Crazy!! He is so adorable, and I can't believe you will both be here soon!!! Woo hoo!!!! True genes of a western Washingtoner. Love the color of the rain coat. He has perfected the art of finding the whole new world of rainy cloudy days when eyes have to look down and find the wonders of nature that we all miss when the sun is shining and we only look up. Love his smile in the last picture!